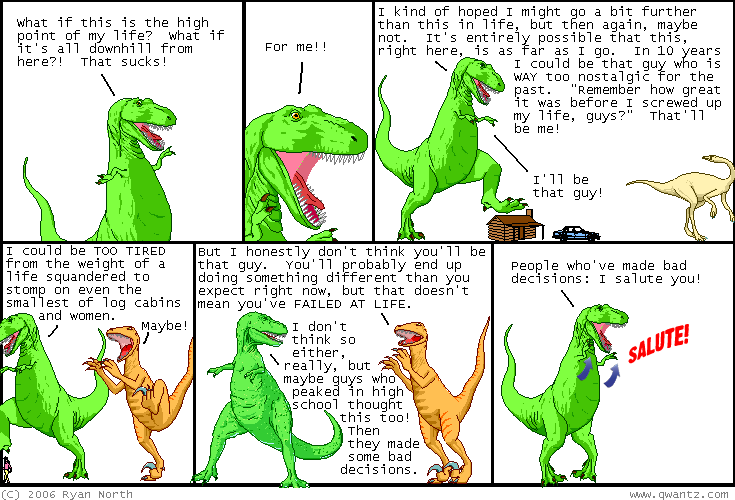 Dinosaur Comics - June 27th, 2006 - awesome fun times! Thinkin' Lincoln - it is about US Presidents, but not in a bad way! Edwitch - it is about a little witch and it has jokes and good pictures! XKCD - it is a low-fi comic drawn by a PHYSICIST. A physicist who works on ROBOTS. This one is one of my favourites! Mountain of Sadness - these comics by Andrew Lin are each brilliant and I would marry them if it were even possible.